It wasn’t just the track events that made this conference championship weekend in collegiate indoor track & field special. The field events were ever bit as exciting as the action on the oval, headlined by a new collegiate men’s weight throw record by Michael Lihrman of Wisconsin. Below we break down Lihrman’s record-setting heave at the Big Ten Championships and check out some of the other big stories in the world of collegiate field events and combined events through Saturday’s action. Because so much happened this weekend, check out our separate post detailing the sprints/hurdles action this weekend, and another post breaking down the distance action. Both cover results through Saturday evening. For all the weekend’s conference championships, hit the button below or click here for the USTFCCCA Conference Championships Central. 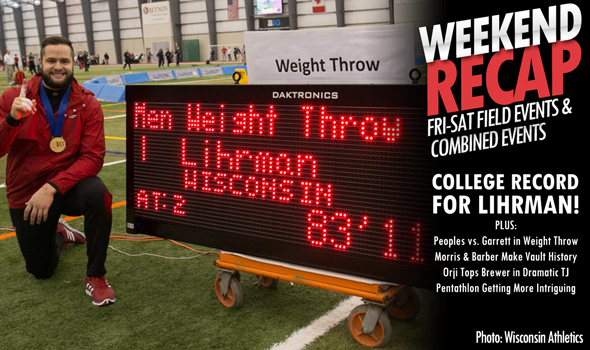 Defending national weight throw champion Michael Lihrman of Wisconsin has waited for this day for a long time. He can take down the “25.09” taped to his wall, because he’s way beyond that now. He’s the new collegiate record holder in the men’s weight throw with an 83-11¼ (25.58m) heave to win the Big Ten Championships, smashing the previous record of 25.08m held by Kibwe Johnson of Ashland. Though the weight throw is an event that’s primarily contested in North America, Lihrman moved up to No. 3 in the history of the world on both the performers and throws list, just 28 centimeters behind world record holder Lance Deal of the United States from 1995. With his huge record-breaking throw on his second attempt, Lihrman obliterated the third-best weight thrower in collegiate history, Purdue’s Chukwuebuka Enekwechi, by nearly two full meters. The Boilermaker, who is the only other man in NCAA DI history to have thrown 80 feet or farther, threw 77-5½ (23.61m) for second-place. How good was Lihrman on this day? He recorded two more all-time top-10 throws at 24.44m on his third attempt and 24.46 on his sixth throw. It’s just the latest chapter in what can only be called a total overhaul of the collegiate record book. Entering the season, only Kibwe Johnson had thrown farther than 80 feet, and he’d only done it once. Lihrman has now recorded nine of the top 10 throws in collegiate history, all of which are farther than 80 feet. Even though he’s No. 3 in collegiate history, Enekwechi’s career-best 80-¼ (24.29) is now outside the top-10 throws in collegiate history. It had been the third-best throw in history two weekends ago. He spoke with Flotrack after the record. Lihrman wasn’t the only thrower making history this weekend. Though she didn’t set the collegiate record in the women’s shot put, LSU’s Tori Bliss etched her name into history becoming just the seventh woman in collegiate indoor history to surpass 60 feet with her winning mark of 60-1 (18.31m) at the SEC Championships on Friday. Though she appeared to run out of steam following that massive first-attempt measurement with marks of 17.78m and 17.12m and three consecutive fouls, she did enough to win the SEC title by more than two feet and break the SEC meet record of 59-4¼ (18.09m) held by Mariam Kevkhishvili of Florida from 2010. She now leads all collegians by 32 centimeters, ahead of frosh phenom Raven Saunders of Southern Illinois. Saunders, the U.S. Junior shot put record holder, will be competing Sunday in the Missouri Valley Conference Championship shot put. In what is sneakily becoming the Year of the Weight throw, the women had their own all-time weight throw match-up between defending national champion and No. 11 all-time thrower Brea Garrett of Texas A&M and No. 7 all-time thrower Kearsten Peoples of Missouri. Garrett prevailed over Peoples two weekends ago at Tyson, but that was before Peoples’ big 74-11¼ breakthrough at home last weekend. Peoples kept that momentum going this weekend as right from the start the collegiate leader took the lead and never relinquished it. After an opening round 69-10¼ (21.29m), she went 72-11¼ (22.23m) on her second attempt to further her lead. The best Garrett could muster in the preliminary three throws – and, in fact, the final three with a trio of fouls to close out her day – was a 72-3½ (22.03m) in the third round for runner-up honors. The day wasn’t over for peoples, however, as she launched her winning throw of 73-8 (22.45m) on her fourth attempt and recorded two more throws of 22.10m ad 21.95m to close out the day. Those two weren’t alone among exceptional women’s weight throw performances, however. Out at the MPSF meet, Ida Storm of UCLA – last year’s NCAA indoor runner-up in this event – recorded the best mark of the weekend (so far) at 73-6 (22.40m) in a nine-foot win. She also recorded a heave of 22.05m. Attempts were taken at both the men’s and women’s collegiate indoor pole vault records this weekend. In other news, the sun rose and set and water remained wet. Friday afternoon, Sandi Morris of Arkansas continued to build momentum as she recorded a first-attempt clearance at a new career-best of 15-3½ (4.66m) to win the SEC Championship, getting way above the bar (see her video above). The height moved her back into a tie for the No. 2 vault in collegiate history and bettered by one centimeter her all-time non-altitude collegiate-best mark. The height moved her up into a share of the No. 7 spot on the all-time U.S. Indoor performers list with Lacy Janson. She came excruciatingly close to a clearance at 4.76m for a new collegiate record, but came up short. She has another match-up with Stephen F. Austin’s collegiate-record-holding Demi Payne in two weekends at the NCAA Championships. The two have split their season series, 1-1. The next day in Mount Pleasant, Michigan, for the Mid-American Conference Championships, Shawn Barber of Akron attempted to break the collegiate record for the third time in four weekends –though he had to recover from a nearly disastrous three-attempt go at 5.45 and another third-attempt make at 5.56m. After clearing 19-¼ (5.80m) on his first attempt for his eighth (!) 19ft+ vault of the season, he moved the bar up to 5.91m – one centimeter higher than his current collegiate indoor record. With eight indoor vaults of 19 feet or higher to his name (including his exhibition Texas Vault Expo 19-3), in 2015, in the past two months he has doubled the number of 19-feet-plus vaults ever recorded by collegians. The previous record for most 19-feet vaults in a season had belonged two former collegiate record holders Istvan Bagyula of Georgia Mason and Lawrence Johnson of Tennessee with two apiece in 1991 and 1994, respectively. Arguably the most exciting field event rivalry outside of Sandi Morris vs. Demi Payne is the triple jump rivalry between collegiate-leading frosh Keturah Orji of Georgia and No. 2 senior Ciarra Brewer of Florida. Each of the two previous showdowns had ended with Orji atop the leaderboard and Brewer as runner-up, and that’s how their Saturday competition played out after drama throughout their six jumps. Two rounds in, it was Brewer who had the lead by a mere centimeter. Orji led off round two with a leap of 44-4¾ (13.53m), only to be topped by Brewer minutes later with a mark of 44-5¼ (13.54). Over the course of their next two jump, both recorded marks within a centimeter of one another – Orji 13.48m on her third attempt and Brewer 13.49m on her fourth. Orji took command in the fifth round, covering 45-¼ (13.72m) to take the lead. Brewer couldn’t respond with marks of 13.26m and 13.31m on her final two attempts, while Orji – just for good measure – went 13.68m on her sixth-and-final attempt. The two will square off again at NCAAs in two weekends, where Orji will look to become Georgia’s first indoor champion in the event. Florida last won a women’s indoor triple jump title in 1992, and Brewer will look to team win men’s triple jumper Marquis Dendy to sweep the titles. Dendy, meanwhile, swept both the SEC long jump and triple jump titles this weekend with relative ease. The big winner of the weekend’s women’s pentathlon action was Georgia’s Kendell Williams, who avenged her 2014 SEC indoor championships to Erica Bougard of Mississippi State with a stellar 4519 to Bougard’s 4376. Though not her best effort of the season, Williams still posted the No. 8 score in collegiate history and now has the top two performances of the 2015 season – both of which came at Kentucky. But, what the pentathlon spreadsheet doesn’t reveal is that Bougard went beyond the pentathlon over the weekend. Even on Friday she did the five-event pentathlon while setting a new career-best in the open 60-meter hurdles in 8.03 for the No. 3 spot on the 2015 collegiate list and a .15 of a second PR AND an eighth-place finish in the open long jump with five attempts. On Saturday she finished third overall in the 60-meter hurdle finals in 8.14 AND she jumped a career-best 5-11¼ (1.81m) in the open high jump to finish fourth. For comparison, she ran 8.20 in the pentathlon 60-hurdles and jumped only 5-5¼ (1.66m) in the pentathlon high jump. She finished the weekend as the high scorer of the SEC Championships with 21¼ points. So take the distant runner-up pentathlon finish with a grain of salt. In the Big 12, 2013 outdoor heptathlon champion Lindsay Vollmer of Kansas posted a career-best 4404 points with career-bests marks in the long jump (6.09m), the shot put (13.12m) and the 60-hurdles (8.35). She’s now No. 4 on the 2015 list behind No. 1 Williams, No. 3 Bougard and No. 2 Akela Jones of Kansas State. Speaking of Jones, she did not contest the pentathlon but she competed in four different events at Big 12s, earning medals in three of them. She won the long jump at 20-10¾ (6.37m), came one centimeter shy of PR in the high jump with a runner-up 6-½ (1.84m) effort, and a third-place finish in the 60-meter hurdles in a career-best 8.14. Needless to say, if all four compete in this event at NCAAs it will be an interesting day in Fayetteville in two weekends’ time. Meanwhile in the men’s heptathlon at the SEC Championships, Garrett Scantling of Georgia moved up to No. 9 on the collegiate performers list with his winning 6036 point total. He’s just eight points shy of the No. 8 spot on the all-time collegiate list, which is held down by his teammate and this weekend’s runner-up Maicel Uibo of Georgia. Uibo scored 5909.